White's big dragon at the top is still eyeless. 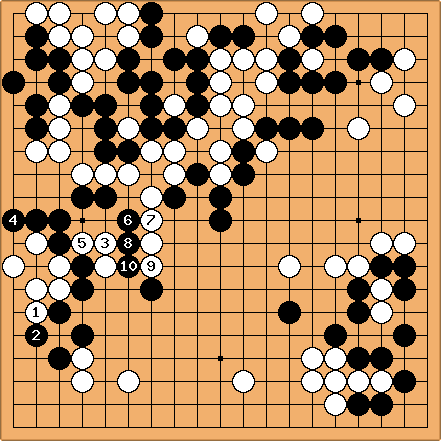 A small group to the left lives, but Black connected his stones. Within the next 10 moves White takes a very adventurous decision - that did not work. With White tries to live on the right side. limits White and forces a reply. in the main diagram is an adventurous decision. White saw life, of course, but at this moment White also saw the possibility of some complications that were too difficult to read - and decided to see what happens. makes sure that the white group to the right couldn't build two eyes. cuts looking for complications. is a peep which White could not ignore, taking into account the unstable position of the group at the top. So White connects with . tries to separate the white groups and White realizes that the combination does not work as planned. Maximum that White could do was to build life in gote, sacrificing four stones. 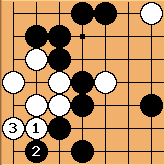 So, in the hope of getting something more, White continues with 9, and Black separates White's groups with in the main diagram. 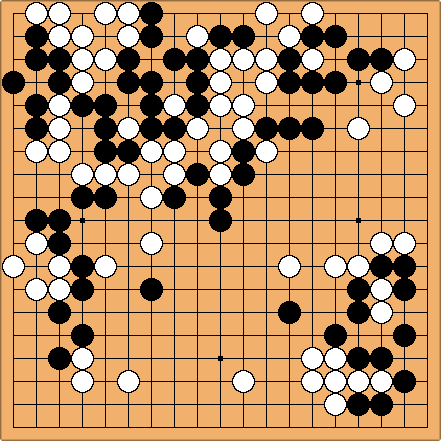 White should have played as shown on the last diagram. White would have half an eye for the top dragon (plus a ko) and would destroy almost all of the black territories. After that Black would probably invade at the bottom and the game would approximately even.